Despite the lack of eggs, we're really enjoying the chickens. They are very messy, though, and I was getting tired of them spilling their chicken feed everywhere from the metal chicken trays. I looked around the Internet a bit to figure out a better solution and decided on PVC feeders. I didn't follow any one plan, but got ideas from several and went to the hardware store. I bought two 3 ft long sections of 3 -inch PVC pipe, two Y joints, and two caps of different types. The design was simple enough for Desert Boy to assemble: stick the pipe into the Y-joint. We added a lid for the bottom, put it on a brick in the coop, tried to secure it as best we could, poured in chicken feed (the newly-acquired canning funnel helped! ), and then put on a lid just to keep anything else out. Assembly was less than ten minutes. We also made one for the run, and for this one we used the sturdier cap for the top and the plug for the joint to keep rain out. Here's Desert Boy filling up the PVC. We only need to do that once a week or so. The chickens seem to be very happy eating out of the new feeders, and the mess is greatly reduced. Success! Sunday afternoon we went out to see some of the flood damage on the North Snake Range. We've had some major cloudbursts from the long monsoon season this year, and it seemed that several of them centered over the same drainages, some of which happened to burn in the Hampton Fire. The combination of burn and flood has transported lots of mud for miles and miles. In the photo above, we visited a house that had mud carry the aluminum cans away from the bin. Desert Boy couldn't wait to go swing on the tire swing. As he ran towards it, we warned him that was something different. When he got to the swing and saw that the ground was now pressing against he, he understood better. The ground level was now higher. No swinging now! Heavy equipment has been brought in to try and divert future floods from inundating the home, but a lot more work still needs to be done. Up on the bench the alluvial fans have fresh material on them for miles out of the canyons. Even canyons that didn't burn have greatly extended alluvial fans. We saw lots of evidence of overland flow (where water flows over the land instead of going into channels). The Hampton Creek channel has been partially dug out, partially eroded. We didn't stay long because the clouds in the background were threatening. This buried cable sign had been buried by a couple feet of mud. We really wanted to go up in the canyons, but the approaching thunderstorm convinced us that we had better take the safer route and head home. That turned out to be a good idea, as when my husband returned the next day, he found several places where water and mud had run across the Gandy Road. Maybe next time we can see more of the flood damage. In the meantime, here are photos posted on the new blog, Life on the Ranch. If you check out some other posts, you may see some familiar things! The colors are changing up high in the mountains, and we really wanted to go see them before they fell off. So after school one day, we loaded up and headed up the Wheeler Peak Scenic Drive in Great Basin National Park. It was a partly cloudy day, and when the sun came out, it was magical. Even when the sun wasn't out, the colors were so vibrant. Our first mini hike was to the amphitheater. The trees were in full yellow. Then we went for a quick jaunt on the nature trail, where we had a snack at every bench. The trail is only about 1/4 mile long and there are many benches, so I guess I shouldn't say there was anything quick about it. Nevertheless, it didn't take that much time. Then it was time to head for a walk around Wheeler Peak Campground. Actually, the kids ran most of the time. They had a lot of energy. When they found this tree stump, they wanted to pose. Some of the leavers were really red. I love it when they turn that way. When we got to the big meadow in the middle of the campground, we let the kids run. They slowed a little to climb up the boulder in the middle. It and nearby rocks became "launching pads," and the kids jumped off them repeatedly. All that running worked up a thirst, so we stopped at a water spigot. …and choosing which way to go. This was Carmela's first visit up here, and she loved all the colors. We repeatedly crossed the creek. I told the kids to stay dry, as I didn't have extra clothes with me, and amazingly they listened. It was a very fun afternoon, and spending time with friends made it even more fun! I almost forgot the sibling carry. They really had a lot of energy! There's supposed to be a big storm coming in this weekend with the snow level at 8,500 ft, so a lot of the leaves will fall off soon. It's been a really nice September, though, so we can't complain! Have you seen good fall colors this year? On Saturday the kids and I headed to Cave Lake for the third annual Take It to the Lake Race sponsored by the Ely Outdoor Enthusiasts. This was my third time to race; in 2012 I did the half marathon, last year the 10k, and this year the 10k. The kids were there for the Kids Fun Run, a mile-long race. Overall there were many more participants this year than last. The race course changed from the previous years; instead of getting bussed to a starting point and running nearly the entire race uphill, we started at the lake and ran downhill and then turned around and back uphill. I liked that better. The 10k race started at 8:30 am and my goal was to be back in time for the kids run at 9:30. However, due to a serious lack of training (my longest run was 3 miles, and I didn't even run the whole thing), I finished in 1:04, so missed the start of the kids run. However, that time was good enough to put me in third place for the female finishers. And our friend Clint won the overall 10k! Way to go! After the run, I "took it to the lake" and plunged myself into Cave Lake to cool off (I had been wanting to do that the past two years and finally worked up the courage to do it this year and it felt so good!). Then I went in search of the kids. Desert Boy was running well. He had quite a determined look on his face for this photo! I had to go quite a bit farther to find Desert Girl, who was hanging out with friends and alternating walking and running. Some year they won't be last. But they're having fun, and that's what matters! And they all got medals a the finish line, which they treasured. Perhaps their favorite part was the mud foot bath after the race. Some of the kids took a full plunge, although the lake was on the cold side. We all had a good time and enjoyed the BBQ lunch and raffle afterwards. Maybe next year I will find the time to train a little better. At least I'm now trained up for a race I just heard about--a triathlon in Delta, Utah on October 4. Desert Boy will give it a go as his first triathlon--stay tuned to see how that goes! I camped out one night this week at over 10,000 feet elevation. To my great surprise it was totally clear and calm, so I was able to break out the camera and wander a little to capture some of the amazing dark sky over the Great Basin Desert. I like experimenting with tent photos. This tent is grey and green, but because I put the light in my blue sleeping bag cover, it showed up blue. Shooting towards the south was the best, as the Milky Way was more vivid. 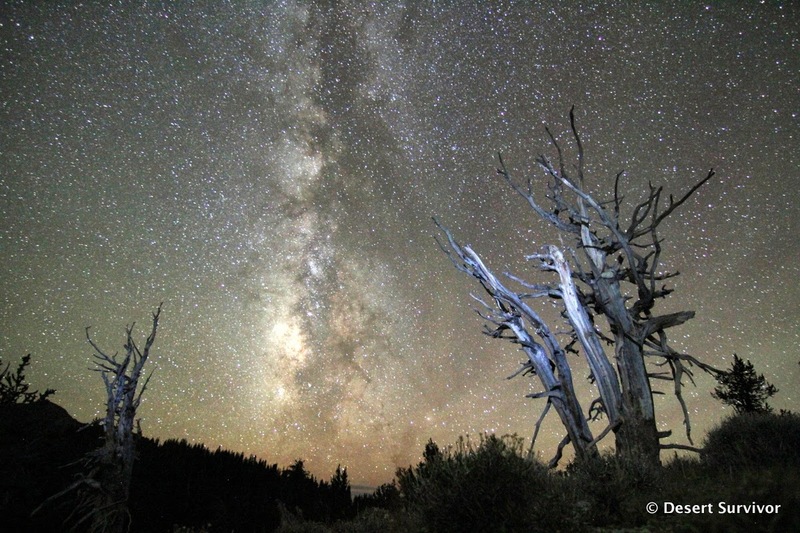 Last night at Great Basin National Park's Astronomy Festival, I learned that's because it's looking towards the center of the galaxy. Or in other words, it's looking towards the city, while the other side is out in the suburbs. Sometimes it's fun to add a little extra light to the foreground objects. It can be tricky to get just the right amount of light. The other really tricky part is to not get airplane trails in the photos. There are so many airplanes that go overhead! I wandered around for awhile, looking for interesting frames for the night sky. This is a hobby that sure is a lot of fun! 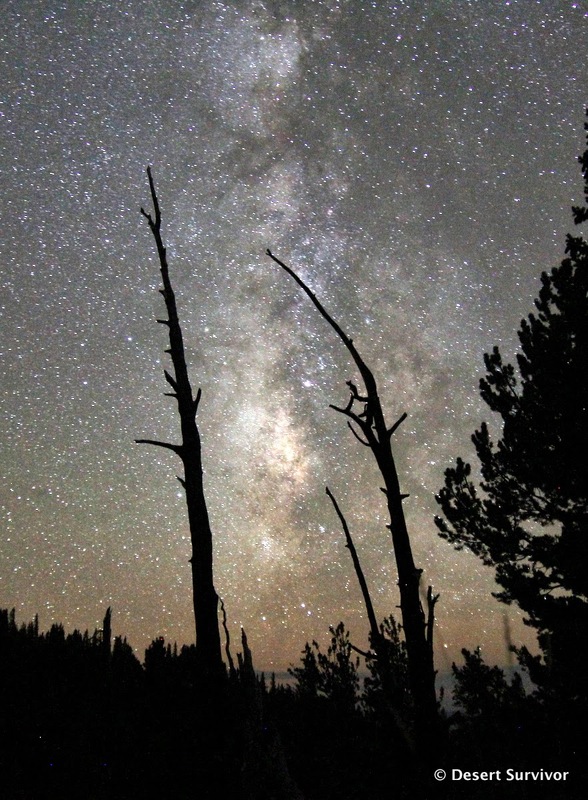 I look forward to learning more about both the night sky and astrophotography. I was contacted by Block Island Organics to see if I'd be willing to do a review of one of their sunscreens, and I quickly said yes. Last year I was quite unsatisfied with the sunscreens we used, so this year I did some research to try to find better ones. I still hadn't found the perfect one though. I want sunscreen that works, is good for the skin, and is a reasonable cost. The first and last parts are fairly obvious, but how do you know if it's good for the skin? My favorite resource is the Environmental Working Group (EWG) database. If you haven't already checked your sunscreen, I recommend you do. Some common ones, like Hawaiian Tropic, have very high ratings, which mean they are more toxic. The database explains why. Even some brands that you think would be good for you, like Trader Joe's, score poorly. Some brands, like Banana Boat, have products that run the spectrum from good to poor. 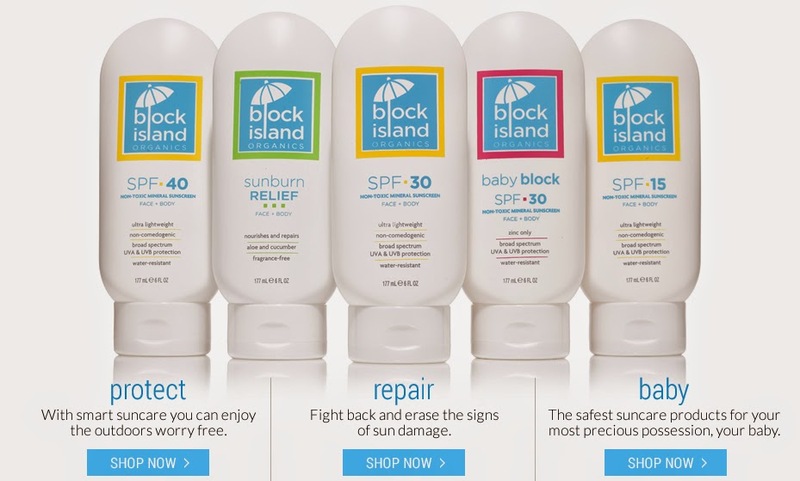 All of Block Island Organics sunscreens score 1 or 2, the best scores a product can get. Here we all are with Block Island Organics SPF 15 sunscreen on. Desert Boy didn't get his rubbed in all the way so has white splotches on his cheeks, but the rest of us did better. We tried out Block Island Organics SPF 15 sunscreen on a couple hikes that happened to be above 10,000 feet, which means the suns rays are extra strong due to the lack of air to filter the sunlight. The sunscreen did great, but according to the bottle needs to be reapplied every two hours, so don't forget! * I keep forgetting that a little goes a long way and squeeze too much out! Here's a sweet deal. Block Island Organics is offering my readers a 20% discount off their products with code gretchenb. This stacks with the sale they're offering right now (30% off), so you can get a really good deal on a great product! The code is only good until 9/24/14. What products do you recommend that help you enjoy your times in the outdoors more? Before my husband and I started our big climb, we had time to see just a few things at Mt. Rainier National Park. The entrance with the huge beams is impressive. Then the road continues through massive trees. Once in awhile you can get a peek at the mountain. Since I knew we would be above treeline for most of our trip, I really wanted some time to savor the huge old trees lower on the slopes. We took a short 0.4 mile hike to some impressive trees. I liked seeing how these two species had grown together. My husband spotted a banana slug. This is definitely a creature we don't have around in the desert! Then we went for a 2.2 mile-round trip to Carter Falls. I was delighted that we got to start our trip on this cool bridge over the Nisqually River. The water was low in September, I can only imagine how scary it might be to cross in June when the water is a lot higher. We came across this old wooden pipeline, wrapped in metal. We were clearly walking on an old road, but never found out more about the history of this area. This is part of the 93-mile long Wonderland Trail that circumnavigates the mountain. On our way back down, we found an older man who was hiking it from Longmire to Sunrise. Soon after we found two middle-aged women who were planning on hiking the whole trail, which takes 10-14 days. Only about 200-250 people complete the entire trail each year, which has over 22,000 feet elevation change. That's like climbing Mount Rainier multiple times! These two ladies had climbed the mountain a couple years ago and were now excited to see the park from a different perspective. A close-up of the old pipe. It didn't take us long to get to Carter Falls, one of the many waterfalls in the park. I had fun playing with a new filter as I photographed the falls. After we hiked back to the vehicle, we drove up to Paradise, one of the main attractions of the park due to the wildflower displays. We didn't want to do any hiking here, as we would be on the trail from here up the mountain the next day. Also, some of the trails were closed due to repaving. That led to one lady who arrived to gasp, "It's closed!" She thought the whole mountain was closed and was clearly distraught. Hopefully she noticed people hiking on the detour route. We checked out the visitor center, which had some rather unsatisfying exhibits hidden away in a corner on the second floor. It was clear that the construction had been done to support the 30-foot snows that occur some winters. Then we went over to the Paradise Inn. It would have been fun to stay there! We thought we might each lunch there, but they started serving too late for us to make it back to our check-in for our climb. The lobby had some interesting architecture. We hope to come back here. We also went over to the Guide Service building. It looked like it had interesting exhibits where maybe we could have learned more about my husband's grandfather and his guiding days, but it was all locked up. The season at Paradise is very, very short, mainly July and August, with some hours in September. We grabbed a bite in the cafe and then headed back down the mountain. We stopped to take a look at Naruda Falls. Here is the river before it drops. And here is the marvelous waterfall. (Can you see the bridge at the top? That's where I took the photo from above.) An old interpretive sign about geology had us stymied, but fortunately a newer one helped to explain better that we were seeing a contact zone at the bottom of the falls between volcanic rock of Mount Rainier and other rock (uh, my memory fails me what kind of rock!) of the Tatoosh Range. We stopped in at the Longmire Museum, where the dated exhibits were much more helpful than the newer ones at Paradise. The kind volunteer at the Museum was also able to answer all our questions. I had to take a quick photo of this old touring bus. Nowadays traffic is really high on the park roads, necessitating lots of construction to try and keep up (not to mention all the floods that periodically wipe out large portions of roads). There is so much more to see at Mount Rainier National Park, but we'll have to see it on another trip. It sure is a lot different than the desert, and it's interesting to see how people, animals, and plants adapt to so much more precipitation.